I have at hand a late Winter catalog meant to reach persons with a taste for European things who have some money to spend on luxury items. 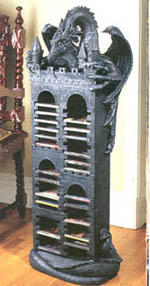 It is a reputable house, whose name I don’t need to mention, that advertises many objects of good quality: leather sofas, tapestries, Milan mirrors, silver walking sticks, medieval knight statuettes, art deco jewelry, and so on. Offering “historical reproductions for the home and garden,” the catalog targets a growing market of persons attracted to Medieval or Renaissance things. I was surprised to see the quantity of Satanist objects being offered. I believe that this is expressive of a broader trend today among stores that aim to reach a public of various social and economic levels. With no more ado, I will expose the pictures to my reader in order to show how our American liberalism is allowing Satanism to enter everywhere under the cover of “art,” and to assume a place of prominence in homes. Figure One is a sculpture of the devil undisguised. 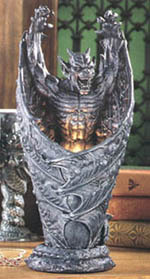 The 13-inch lamp features a devil crossing its bat wings to enclose a light bulb that illuminates its face, projecting the sinister shadows of Satan in your study, office, or bedroom. It is all the fashion in some circles to display this “amusing” kind of novelty. With Figure Three, we move to the garden, to be greeted by a figure representing an impish kind of fiend. With a malicious grin, it crouches, inviting you to admire its wily spirit. 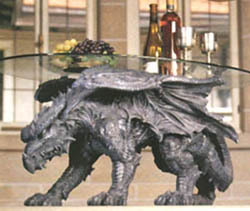 Figure Four is a demonic dragon with its pointed claws open and extended, a wall pediment to hand over your doorway. You have to pass beneath its fiery gaze every time you go in or out of the house. Another monster with a devilish hue, Figure Six, watches over your CD collection. The parade of demons and monsters continues - there are another 20 or so products like this being offered in this single catalog – but I will stop here. Someone might argue that the use of gargoyles is just a medieval custom, and that today’s revival simply represents a general taste that some people have for the Middle Ages. I know enough about gargoyles and how the Middle Ages used them, since my doctorate is in this period of History, to assert that there was a whole different concept that supported their use as décor in that Age of Faith. 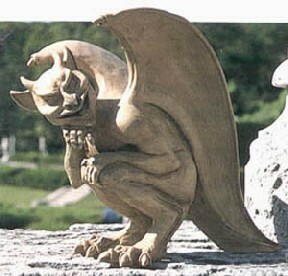 Medieval men placed gargoyles on their cathedrals and castles in humiliating positions, e.g. as a gutter drain, to express the rejection we should have for the horrendous and demonic.Or they displayed them as cunning schemers conniving to take more souls to Hell, e.g. 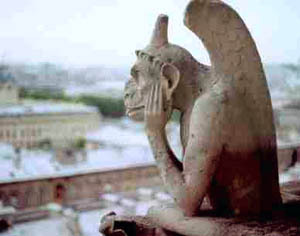 the “Thinker” that sits on a front balcony of Notre Dame Cathedral and plots the destruction of Paris. Those gargoyles were set in such places and positions to stimulate the vigilance of the faithful. Be ye sober and watch – that is to say, the gargoyles, which clearly represented the devil, were meant to stimulate militancy. They were supposed to be rejected and teach man to be suspicious of the devil. In this new wave of fashion, devils and demonic monsters are presented to be accepted, and even enjoyed, just as they are. There is no more rejection. In fact, to the contrary, they can serve as butlers offering wine, lamps providing illumination, or ornaments to amuse and entertain in the home and garden. I have spoken of the tendencial revolution before, how the Revolution first creates an environment that stimulates acceptance of something objectively wrong, such as witchcraft and Satanism. Then, after this initial tendencial preparation has been made, it will introduce new doctrines and ideas that will be accepted. (1) Now, I emphasize it again, because if we understand this important concept, we will be well on our way to breaking the American liberalism so firmly implanted in our culture. 1. “Chapter V: The Three Levels of the Revolution: In the Tendencies, the Ideas, and the Facts” of the celebrated work by Plinio Corrêa de Oliveira, Revolution and Counter-Revolution, Chapter 5 (Sao Paulo: Chevalerie Artes Graficas e Editora Ltd., 1993). plotting the destruction of the city. The unwary man who shrugs his shoulders and casually lets this “art” be placed in his home, unconsciously becomes complacent with Satanism. American liberalism, which takes everything in a superficial way, sanctions a cultural ambience that propitiates the introduction of Satanism in our day-to-day life. It laughs at anyone who says there could be consequences to “trifling” matters like this. Catholic vigilance teaches us the opposite: to be vigilant, trying to discern the direction the heads of the Revolution are moving so we can resist and counter-attack. Permit me to close with a warning. Beware, nothing is done by chance. In a famous vision, Pope Leo XIII saw that Lucifer had been released from Hell to try to destroy the Church and take over society. It is not difficult to recognize that this dream has become a reality in many regards. Today we are witnessing an attempt by the Revolution to make the Devil be admired, venerated, and perhaps even adored. The smile of the supercilious optimist at this commentary doesn’t make any difference for the realization of this plan, except perhaps to facilitate it. As Scripture tells us, Stultorum infinitus est numerus [The number of fools is infinite] Eccles 1:15.